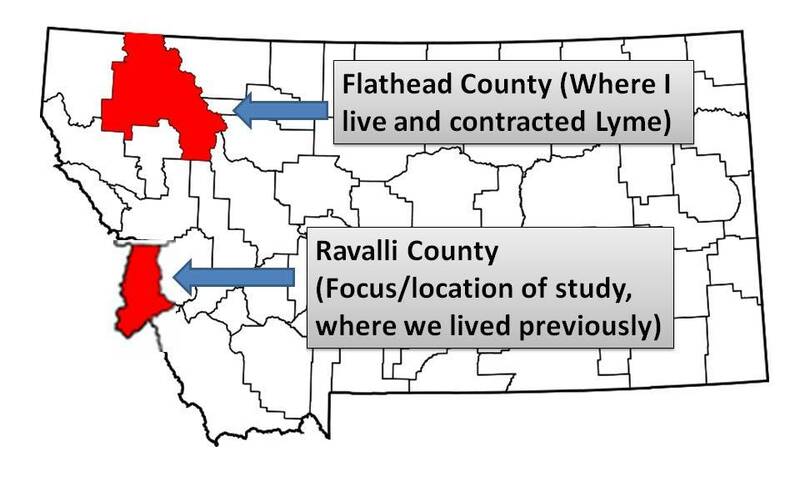 I heard from another Lyme patient about a week that there would be a Lyme disease study starting in Ravalli County with pediatrician Blaise Favara, and last night it was on the news. When I first heard about it, he study part was quite exciting, although they are not looking at my area. What made me catch my breath was the name associated with it. I haven’t seen that name in writing in over a decade, since leaving the Bitterroot, other than on my daughter’s medical records. So, being a Lyme patient in Montana, this study hits home for me in a number of ways. I missed seeing the study on the news, but got texts and messages from friends right way, and also got posts from other Lyme patients (people I already knew as well as people I didn’t, which was very neat). 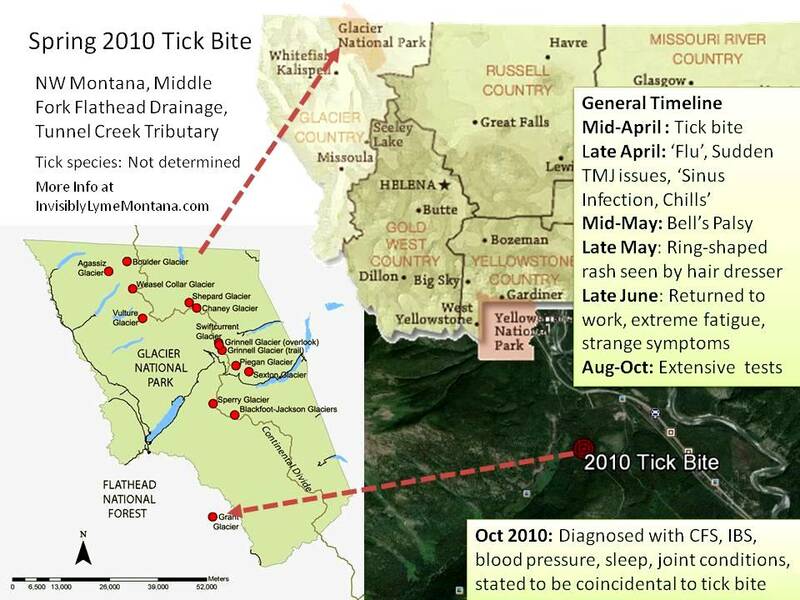 NBC MONTANA STORY: Scientists research prevalence of Lyme disease in Ravalli Co.
Dr. Favara was my daughters pediatrician, years before I contracted Lyme, and he saved her life. She had minor anemia that wouldn’t respond to supplements. When we moved from Great Falls, a doctor I had worked with helped us find a pediatrician that would keep an eye on it. One day she had a low grade fever and was scheduled for labs. Dr. Favara’s office called to say she could do bloodwork but didn’t need to be seen. I couldn’t give a logical reason, but wanted her to be seen anyway (I was a pretty logical mom and completely upfront about the no real reason part). They called back to say that was a good enough reason, and he saw her anyway. He noted the fever and asked if that had been a pattern. It had been, but barely really even elevated. Like the iron, it was just enough to notice, and not enough to be really alarming or all that noteworthy. He did a head to toe exam, and felt something in her abdomen. It was large enough for him to feel and located such that it could be an enlarged spleen. He started talking to Seattle Children’s Hospital and advised that they’d do their own tests there (it’s hard to remember for sure, but we may have gone straight there rather than waiting on local tests). She had a myofibroblastic inflammatory pseudotumor. The story gets longer from there, but the team in Seattle was equipped to recognize it, although it was incredibly rare and had been initially assumed to be cancer. They saved a lot of time and risk in recgonizing during the initial biopsy that it was something different than they were used to. So, obviously, it is an understatement to say that we are forever in Dr. Favara’s debt. There is no current/recent/published survey data that I have found that supports this. It would take enormous survey effort to indicate the absence of a species. North Dakota employed the same logic about the absence of deer ticks and Lyme disease, but surveys in just nine locations this year found deer ticks in six locations, with Borellia burgdorferi spirochetes identified in their guts. Confusion over the geographic distribution of the illness causes enough confusion to keep doctors from adequately considering what disease the patient before them is presenting with. I was precluded as having Lyme based on geography, whereas my doctors should have tested sooner and more rigorously for Lyme and should have considered my tick bite, Bell’s palsy, circular rash, sore throat, chills, jaw pain, joint pain, debilitating fatigue, and ensuing lengthy list of symptoms as extremely strong indications of tick born disease or combination thereof. I left a couple of comments on the articles linked above the day after the story aired, one of which I copied here. Hello KPAX, I am in the Flathead and was bit by a tick in the Middle Fork drainage while working as a biologist in Spring 2010. I had numerous symptoms that I didn’t connect to each other or the tick bite until half of my face and neck were paralyzed. I was told it wasn’t related to the tick because we are in Montana. 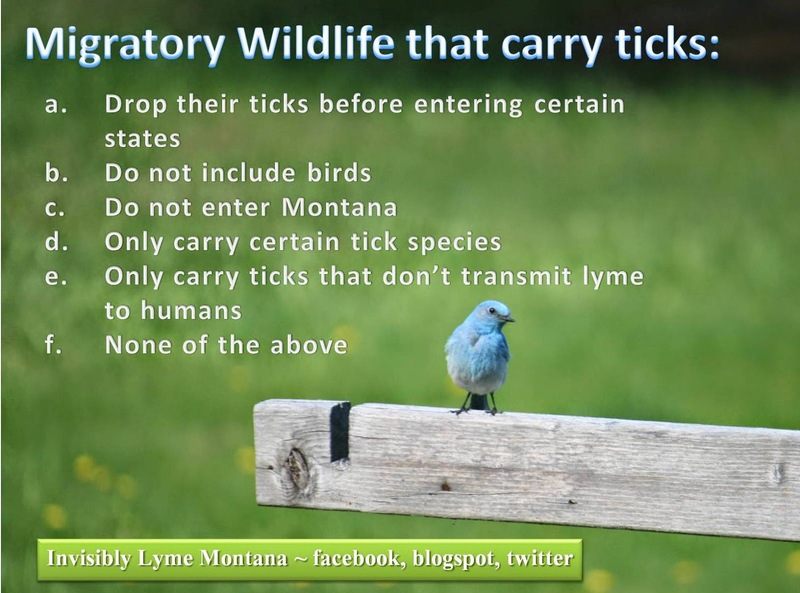 By fall, I was diagnosed with Chronic Fatigue Syndrome, IBS, orthostatic hypotension (debilitating at the time without medication), a joint condition, and a number of other symptoms and/or disorders, all said to be unrelated to the tick bite, because we don’t have Lyme in Montana. As a biologist, I am wondering how we know this. The argument I tend to find that what I and other patients contracted, with or without positive Lyme-specific bands in lab tests, is either not Lyme (because of our geography) or we got it somewhere else. The clincher is that if we didn’t travel east, we automatically don’t meet the definition of Lyme here. It makes me wonder how we are ever going to have the first documented case that will allow the rest of us to have hope of being diagnosed quickly enough to recover. I was misdiagnosed for the first three years, until leaving the state for testing and treatment. Most of my ‘disorders’ went away when I was treated for Lyme and two other infections I contracted, most likely at the same time. I have precise maps of my location, know fairly precisely where I startled a moose and dove through thick brush. I know from medical literature that transmission of Lyme to humans is not isolated to black legged ticks as the only vector. This is an exhausting illness due to symptoms, but the financial and physical ruin that comes from falling through these cracks makes it very tiring to have to see the same thing happen over and over again to Montanans that contract Lyme here or elsewhere without having better answers as to why we are making these assumptions and why we can’t get care here in our own state. There’s more to this issue than I can account for here, but please be aware that many people over the course of at least the two decades have contracted Lyme here, or as numerous articles have put it in the past, “a related illness from a related tick”. It’s time for this related illness to stop progressing to debilitating illness in treatable patients. Please help us spread information to keep this from happening to more people. Five years post tick bite I am home in bed still recovering, still traveling out of state for care. I fought with every bit of my being and health to continue working and would not have willingly let go of my career for anything. Nor would I have robbed my kids of the last five years of normalcy that they deserved in their childhood. I too to have Lyme disease but I do not live in the Bitterroot Valley, I live in Lake county. I’m one of the few that has neurologic Lyme, I’m in a wheelchair. I was diagnosed with MS in 2002 but Lyme in 2012. I too have to leave the state for care with a Lyme Literate doctor.